This is not a popular topic. But I notice that the March for Life takes place again this week — on Friday, Jan. 18. And my two daughters recently had babies. According to an old Life magazine photo spread depicting pregnancy, by two months gestation, both babies had near-microscopic fingerprints. Fingerprints. Shortly thereafter, both had clearly differentiated teeth. Last January, I went to the March for Life in Washington for the first time, partly out of journalistic curiosity and partly, probably, because of the realization that my grandchildren were so well-formed so long before I met them face to face. The DC march is no fad or passing fancy. This is the same march, the same cause, the same Hail Mary intention, for 45 years running. I was expecting to be suffocated by over-the-top religiosity and supersized photos of aborted fetuses, both so often associated with the pro-life stereotype. But I’m glad I went to see for myself because it wasn’t like that at all. Though many newsrooms dictate that the movement be called “anti-abortion,” it’d be hard to call this day anti-anything. This day was life itself. It was life celebrating life, life making a case for itself. It was an overwhelmingly young, banner-carrying, flag-hoisting festival, flowing uphill from the National Mall to the Capitol, hats and shirts and signs calling out schools and parishes and dioceses and universities from around the country. There were strollers as well, and wheelchairs, each with its own life story: birth defect, terminal cancer, old age. But what knocked me over were the numbers. I’d had no idea. From high ground atop Capitol Hill, I watched as this happy river flowed uphill and past me for hours. They kept coming and coming, up the hill, 15 abreast. I postponed my train reservation home, determined to see the event through, but even that was in vain. When finally I left, looking back down the hill one last time, I saw that the colorful mass of life continued to extend as far as the eye could see, down Constitution Avenue, cheering, waving, appearing never to end. I overheard one man, walking in the other direction, mutter to his friend, with a cynicism familiar yet completely at odds with the day, that “these are the ones who will be having abortions.” Perhaps. But meanwhile, these were genuinely friendly, with minimal bodily adornments, and polite, even when the crush of the crowd on the National Mall made politeness almost impossible. I heard the f-word a total of twice all day. Sometimes I think the young have an easier time being pro-life. Many of the rest of us have by now experienced abortions — acknowledged or not — in our circles, and we are aware that some may have taken place if not among ourselves then among those we love. If we were to come out as pro-life, would these people who matter so much to us understand that our being pro-life isn’t directed against them? Better not to cause insult, misunderstanding, or more pain by seeming to judge. But judgment was hardly the mood here on the walk up the hill. Here, it almost seemed that the more life you’d lived, and perhaps taken, the more embraced you were. Welcome to the human race, so to speak. What caused me finally to dip my toe in the waters of pro-life is the gathering momentum of its opposite: the 85 percent+ abortion rate of Down syndrome babies. The cause of euthanasia and assisted suicide being carried — sold, if you will — by beautiful, sympathetic heroines. The hideous, heretofore unthinkable violence, disrespect and crudeness now seemingly normalized in real life, on social media and on screen. Of course, religion seems a big factor in the whole choose-life thing. 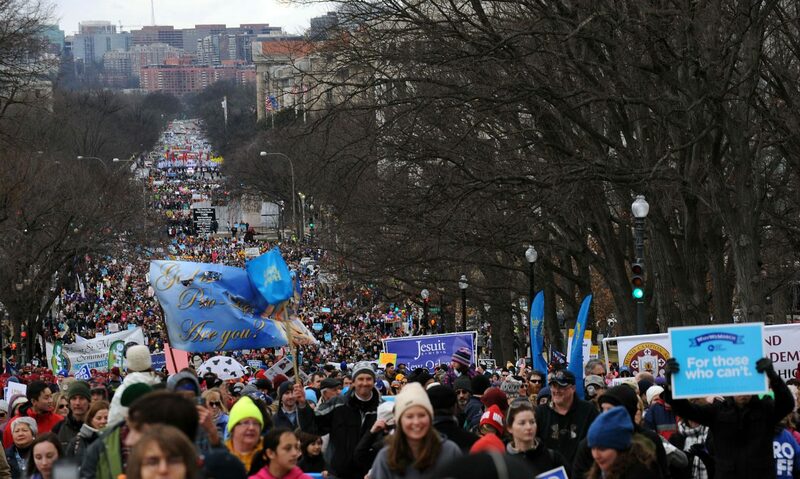 The March for Life kids were overwhelmingly Catholic. Many of them had been encouraged to attend by their schools or parishes — perhaps the last remaining institutions to take a pro-life stand. But young people of many faiths were there, and many honor motherhood. I see their kind in my supermarket, where there’s a popular kosher section, and where the moms’ skirts are long, their hair is covered, they’ve a child in the cart, on the backpack and in the belly. I’ve seen their kind in the no-nonsense, young and hardworking Amish women I’ve met in my travels as a reporter. Their culture also encourages the taking of a chance on life. So does religious faith make it easier to take that chance? Is it easier to resist the temptation to tamper with the “yes” or “no” of life if you believe in God? Or, more than that, if you trust in a God who is interested in you, specifically? So that, Mom, even if you’ve got the controls in your hand, and all signs say you should use them, you know that within this excruciating surprise pregnancy, a surprise you’d give anything not to have, there is the possibility of good? So that even if you don’t know what life will demand of you, you know that someone unseen is with you, marching up the hill? Who knows? Mary Beth McCauley is a national award-winning journalist who writes often about religion, morals and values.